The Kottayam-based couple studied in the same school and later went on to marry. Ask Madhavan Nair and Meenakshi Amma for how long they have been married, and 99-year-old Meenakshi Amma creases her forehead, as if lost in deep thought. Sitting beside her, 100-year-old Madhavan Nair does not need much prodding to remember the year they got married – Malayalam calendar year 1111. Meenakshi Amma nods in agreement. “See, he still remembers it so clearly!” she says, breaking into laughter. 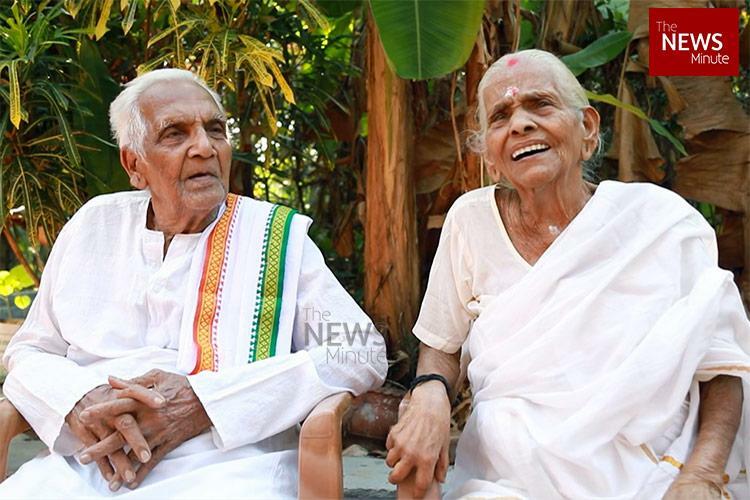 The duo celebrated 82 years of their marriage in December 2017 and the milestone also coincided with Madhavan Nair’s 100th birthday. In their house near Pallikkathode in Kerala’s Kottayam district, Madhavan Nair – who used to be an active member of the Congress party – and his wife Meenakshi Amma, continue to live their “happily ever after” to this day. When TNM visited the couple, Madhavan Nair and Meenakshi Amma shared their eight decades-long love story. Although the duo first met in school at the age of 8, little did they know that the coming years would bring them together. After a few years of studying in the same class, both Madhavan Nair and Meenakshi Amma moved to different schools. Having known each other since a very young age, Madhavan Nair and Meenakshi Amma have retold their wedding story many a time to their children, explaining how theirs had been an arranged marriage and not a love marriage. The couple have five children together, all of whom stay in Kottayam. “It is true that we knew each other from school. We had seen each other, but hadn’t spoken much. What do school kids have to talk to each other at that age? Years later, our families decided to get us married. So that’s how it happened,” Madhavan Nair says. When asked whether they feel the weight of 82 long years, the two of them smile. This writer was charmed to see Madhavan Nair’s toothless grin while Meenakshi Amma guffawed loudly, displaying her perfectly aligned teeth. The years where Madhavan Nair was involved in party and social work had not been easy on his family, he admits. The odd working hours and the long absence from home did not exactly bode well for a harmonious family life. But Meenakshi Amma is in no mood to send her husband on a guilt trip. “People would come to get him. He would go with them and share whatever knowledge he had. It never bothered me, since I knew he was going on work and not for anything else. He would return home after work for sure,” Meenakshi Amma says. However, Madhavan Nair has for long withdrawn from his years of active social life, and now spends most of his time at home. While minor health issues do trouble Meenakshi Amma, Madhavan Nair likes to dismiss age-related woes. Despite having to rely on a walking stick, the 100-year-old is young at heart. “I walk around the house and the yard at times. With this walking stick, I can walk as far as I can. But I am not so young any more, I have no teeth left and I don’t think I look good with this toothless grin!” Madhavan Nair says.